These colors make me so dang happy. They remind me of a box of crayons, or a bed of flowers, or a bag of skittles ... just filled with cheer and happiness. 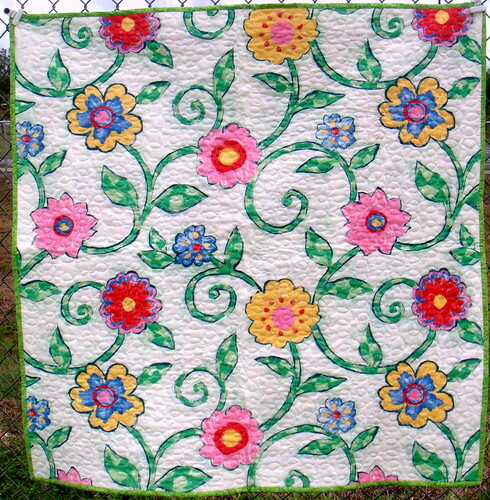 I came across this quilt and fell in love with it. I filed it in the back of my mind, but not for long, and started my version of the quilt within a week or so. As I was working on the colored blocks I decided to make two quilts, one girly and one more boyish/neutral. I'm working on the binding of the second one (and wondering how a quilt like this would look in tans/browns/creams ... hmmm ...). Other than the white cotton sashing the front is made entirely from smallish scraps. I bag everything smaller than 5" wide that's still big enough to do something with ... lots of excess binding strips, squares cut too small, etc. All the fabric used here came from those bags. Some fabrics I could make one or two squares from and some I could make quite a few. As always, going through the scrap bags is a delicious trip down memory lane, recalling the time and place each of the fabrics was used and who it was used for, or where it was purchased and what the circumstances were. I tried to be as random as possible with the fabrics, not paying attention to the tone or shade of the colors. 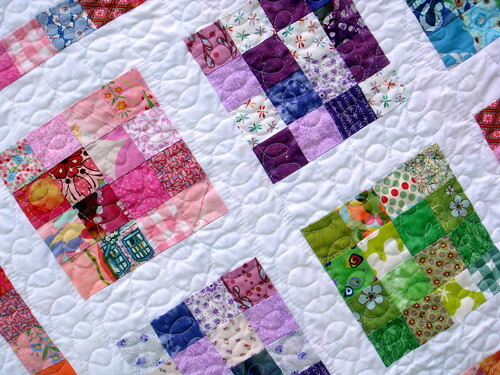 There are a few fabrics I'm not sure if I should have used but when I look at the quilt as a whole I don't see them. I absolutely love working with the scrap bags and end up creating my most favorite quilts from them. How do you feel about working with scraps? 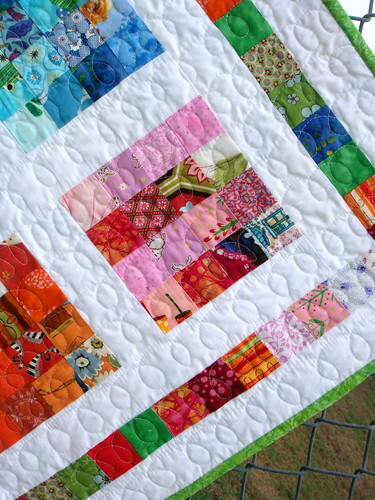 Any scrap quilts to share? Or other scrap projects? I'd love to see them. Each of the 16 piece blocks started with 2.5" squares. The border is a long row of pieced 2.5" squares. The backing is a treat in itself, as far as I'm concerned. I bought that fabric a year or two ago ... at WalMart ... for $1 a yard. I bought quite a few yards and this was the first time I'd used it. I heart it. I can't believe I forgot about it for so long. 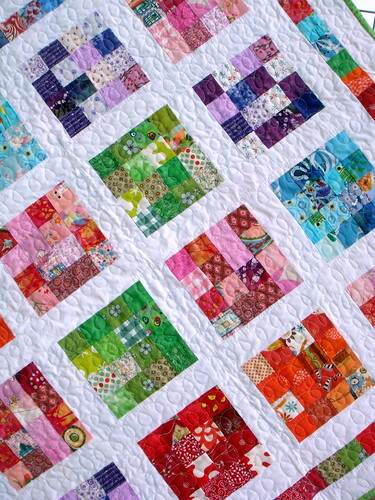 The quilting is done with loopy swirls in long rows. Super easy and quick. I really enjoyed the rhythm of the loop making ... very tranquil. The binding is a green batik with blue flecks in it. I'm not sure what I should start on next. Nothing is jumping to my mind. Any ideas? edited: somehow I posted one image twice, edited to change that! Absolutely stunning quilt. Lovely colours!!! 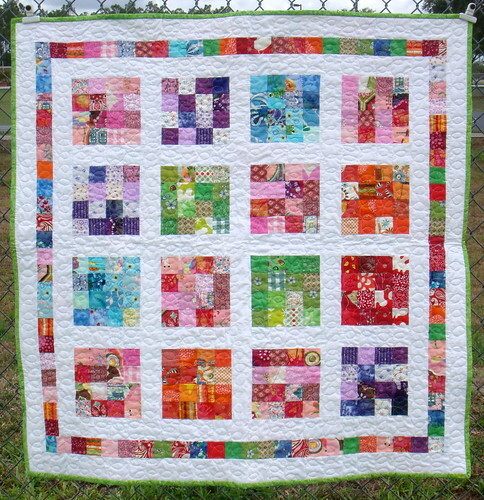 I also LOVE the quilt you linked to and I LOVE your version! thank you very much for the inspiration!!!! That is so cute! I love the backing, it's perfect! I LOVE this quilt. You did a great job - the colors are beautiful and it is such a treat to look at. I'm inspired! I recently finished a fun project I came up with to use some of my Japanese fabric scraps that were small, but I couldn't part with. You can see the result on my blog.